While I've also written about how it would be nice if over-protective non-parents, (I call them ravens), would chill out, it occurred to me that I haven't seen pieces about how we--parents of kids who play outside--could help these non-parents to chill. I don't know if there's a method that will help every neighborhood and neighbor. I don't even know if the method I'm about to describe helped in our neighborhood where we haven't had any issues at all with people who live here. 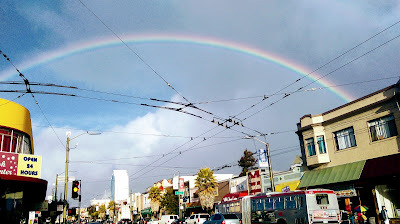 It could be that we're just lucky and that our neighborhood is just naturally awesome. In order for kids to freely engage in independent outdoor play, parents have to take the time to fully engage with their neighborhood, integrating it into their every day lives. Three years ago when we moved from our small town, suburban neighborhood to the 'big city' of San Francisco, my partner had only one request for how she'd like our lifestyle to change. "I'd like to make sure that we know our neighbors at our next house." In the neighborhood we were moving from, the houses were widely spaced apart, there were no sidewalks, everyone drove everywhere; we just didn't see our neighbors much. In addition to all these excuses, I have to admit, I never made any effort to get to know our neighbors. Since we were moving to the city I had wanted to live in since I first visited it at the age of 10, I thought it was the least I could do to work as hard as I could on my partner's one simple request. I made sure to approach each neighbor we saw to introduce myself, my partner, and the kids. We also found out their story, their names, what they did for a living, how long they'd been in the neighborhood; all interesting stuff. The layout of our neighborhood worked in my favor this time. The houses aren't just close together, they're adjacent; the sidewalk is huge; almost no one drives everywhere because public transit is just that good; the weather is gorgeous most of the time, so people are outside more. Parenting books and websites talk a lot about modeling positive behavior for kids, so what happened next shouldn't have been a surprise. The kids started meeting more of our neighbors on their own! They became fast friends with the gentlemen who own our local convenience store--they were the first people then five year-old No. One wanted to invite to our house for Thanksgiving. They met a retiree who lives a few blocks away and walks her dog every day. While out with their Director of Tac Ops, (aka nanny), they met other people in the park whose dogs met our dog. They met neighbors who rode the same buses they did. You get the idea. I routinely meet people who ask me if I'm the gangs dad because they see me out with the same dog they see the kids with, or they think they've seen me walking by with the kids that they ride the bus with. The simple act of getting out to meet our neighbors is now self-perpetuating itself through the kids' daily lives. The kids do hangout outside; they play by themselves in nearby parks; and thankfully, we've haven't had a single issue in the neighborhood. Is it because we know our neighbors? I think so. Even if our neighbors weren't the super-cool people that they are, I think it's a lot harder to make trouble for someone you know than for someone who's basically anonymous to you. Oh, and one other thing. Even though I know it's safer than ever for kids to be out and about on their own, I also know that I still worry. I don't worry as much as I might though. The kids have built up a network of people that know them, and who are looking out for them. I didn't realize when we met our neighbors--a simple friendly task--we'd be making the environment we live in so much better for the kids. I'm so glad we did it anyway though. I don't worry so much about ravens anymore, and it's really nice that the kids are getting to grow up in a world that's inclusive of them, rather than dismissing, or simply oblivious.